What Makes Hay Pillows® So Unique? Only slow-feeder hay bag designed for ground feeding. Allow your horse or Mini to eat in a natural grazing position. Easy to fill & transport. Place in multiple locations to encourage movement. Machine washable & Made in the USA! Helps with allergies or respiratory issues – keeps hay out of the dust, sand and your horse's eyes. Enables nasal passages to drain effectively. 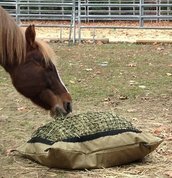 "As an equine veterinarian and dentist, I highly recommend the Hay Pillow to my clients. I use them for my personal horses and have been really pleased. I prefer to feed my horses in correct anatomical position - on the ground! They are durable, and keep my horses with hay for hours at a time with no mess/discarded hay. When they get dirty, we just throw them in the washer! Excellent product." "​I am a veterinary surgeon who has recently switched his focus from general practice to specialize exclusively on horses' feet and to concentrate on studies and research into laminitis. There are great benefits in 'slow-feeding' horses and I have witnessed just how effective The Hay Pillow® is. I am also impressed with the quality of the product. I would recommend The Hay Pillow® to all horse owners." “We enjoy recommending TheHayPillow.com for offering free-choice forage in areas where pasture isn’t available." We promote slow fed, free-choice forage in multiple locations to encourage movement!